Eye-catching decorations? Check. Clever cake toppers? Check. Goofy games? Check. Well-informed, witty conversation? With our printable party kits infused with fun and fascinating trivia from our friends at Mental Floss, that goes without saying! They offer the memorable experience of a party where a smattering of historic smarts (like the fact that Woodrow Wilson is on the rare $100,000 bill) is the main attraction. 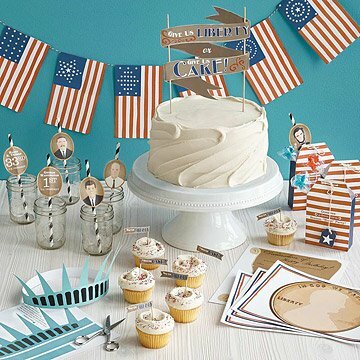 If Patrick Henry threw our history-themed party, he might have hungrily exclaimed, “give me liberty or give me cake!” While you can’t rewrite American history, you can make your next party one for the history books with this custom kit. It includes “Patrick Henry” cake and cupcake toppers, Boston “treat” party goodie bags, and fun, Founding Father facts from Mental Floss. As you celebrate, bandy about the fact that Lincoln is the only President whose coin profile faces to the right (honestly! ), or the fact that Kennedy’s White House hosted a menagerie of animals. Featured throughout the kit’s components, these factoids will help you and your guests elevate your history buff smarts. Each part of the kit provides simple yet detailed directions for crafting decorations, games, and special details that’ll bring a bit of Independence Day to your party, any time of year. Click here for your free download of the Printable Party Kit - History Buff. Thank You for This Fantastic Party Kit! I teach a small class of children, who all give an end of year presentation dressed as a historical figure of their choice. This was perfect for them! We had such a blast! This was such a perfect find and the everything printed beautifully! Thank you so very much!